I do not intend to sound apocalyptic but events are moving at such breakneck speak that I nurse fears that Nigeria will never remain the same after the fuel subsidy agitations, no matter who wins. This is predicated on what is happening across the globe as well as the peculiarities of the Nigerian situation. The Arab Spring has created a model of passive resistance built on defiance and peoples all over the world are appropriating this example to press their demands on the government of the day. It is the nearest thing to a non-violent revolution and the contagion effect has been bewildering with virtually all corners of the world actively espousing one form of it or the other. 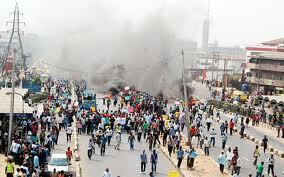 However, Nigeria stands at a security crossroad and this makes the impending strikes and protests portentous. The story of how we have come to this sorry pass is due largely more to government’s insincerity and insensitivity than to sabotage by organized labour and civil societies. The issue of removing fuel subsidy has been protracted, spanning several governments and decades. Successive regimes have tinkered with the price regime of petroleum products increasing it marginally over time.it is on record that Obasanjo did more to hike the price of petroleum products than all previous governments combined, and during the last days of his administration, the Otta farmer raised it to N75 which the government of late Yar’Adua shot down to N65. It should be noted that the incumbent President was the second in command when the raise was reviewed downward. Then stepped in Goodluck Jonathan. 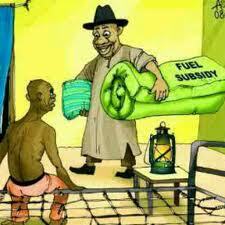 Let me start by stating here and now that Mr Jonathan never raised the issue of fuel subsidy in his campaign trips. He probably did not have an idea of the full picture of the subsidy matter until Ngozi Okonjo Iweala made a grand entrance on her 2nd missionary journey as a minister. Having recorded partial success in her World Bank-prodded reforms through the removal of subsidy for diesel in 2006, she hit the ground running this time around, exploiting her position as the coordinating minister to nudge Jonathan into acquiescing to removing subsidy on fuel. However, while the populace was still mulling over the idea and debating its merits, the government gave the nation a New Year gift of shock and since then, we have all been on tenterhooks . I believe that the government has been shoddy in its management of the issue. Let us, for the sake of dialectics, assume that there was subsidy on petrol. The vital question is whether the subsidy on its own has the potential of inflicting the economic injury predicted by the protagonists of subsidy removal? I deign to say NO. I say NO because there is yet no consensus as to the actual value of the subsidy, vis-à-vis the actual consumption. During the Town Hall meeting organized by the Newspapers Proprietors, Sanusi and Oshiomhole admitted as much that Nigeria does not consume the amount of petrol that approximates to such hefty sum. Mallam El Rufai said, and nobody in government has contradicted him, that the Obasanjo administration spent less than N300 billion in 2007. There is equally yet no explanation as to how the cost of subsidy has mushroomed to about 1.3 trillion naira in less than five years. The corollary is that corruption accounts for whatever is the difference between the value of the actual consumption and the amount bandied by government apologists. It is a fact those who have licence to import refined petroleum products are the very people who doled out money to fund the election of the incumbent government. They are the so-called cartel, who scores of commentators have described as being untouchable. In fact, Sanusi admitted that they were so rich that they could compromise anybody. It is instructive also to note what Oshiomhole said concerning efforts to sanitize the system by inviting external auditors to look at the books. The forum that suggested that was promptly disbanded and their input shelved to gather dust, if it has not even been destroyed. To put the icing on the cake, the President himself expressed on national television during the last Presidential Media Chat on December 23 that he nursed no agenda to go after the so-called cabal because he did not want to indict anybody. There is no sense in the apparent conviction by the government that removing subsidy on petroleum will translate to an economic fillip. My people have a saying that a child should not go asking what killed his father until he is ready to confront the thing, else he will go the way of his father. The relevant question to ask, then, is whether the government has demonstrated sufficient will to fight corruption; whether the body language of government officials gives Nigerians any confidence to believe that a departure from the past is imminent; whether the government has the moral authority to demand such onerous sacrifice from the people while the so-called cabal walks free and continues to plot further banditry against our common purse. Ben Murray Bruce played a song for Okonjo Iweala during the Town Hall meeting to the effect that government should lead by example by practising what it preaches. If that be the best canon of leadership, then Jonathan and his officials have failed to provide the Spartan model for us to follow. Convoys of government officials still stretch beyond the horizon when they move; government still maintains the best fleet of automobiles in the market and even budgets for more; countless meaningless trips outside the country on spurious engagements are still the hype; India, Germany, Saudi, the U.S. and the UK remain destinations of choice when an ailment as common as cold afflicts our public officers. Yet they do not have to queue and buy fuel with their personal funds. So where lies the example we ought to follow? In deep sea diving, a diver is outfitted with gears that enable him to survive the high pressure environment. However, when he ascends to the surface, he must observe his decompression stops, which is designed to eliminate the formation of bubbles of inert gases within tissues of the body and thus prevent what is known technically as the Bends, which is a potentially fatal condition. An accomplished diver, even where he runs the risk of exhausting his oxygen supply, knows better than to skip the ritual. This analogy applies to Nigeria. We have been having been in the deep but have to come up for air by way of deregulating the petroleum sector. However, rushing into it without putting the necessary facilities in place to absorb some of the socio-economic dislocations that it will occasion will create so much contortions in the polity and heighten the already frayed emotions in the land. That is my fear. Our leaders are already on the phone to Washington to inform the capitalist overlords of a successful deregulation even as the fates do hi-fives as our nation rolls closer to the precipice. The moment is truly momentous and we stand on the threshold of joining in the global fraternity of those who insist that the government is for the people and not the other way round. As the countdown clock ticks to Monday, it may be wiser for the government to err on the side of caution by having a rethink on the issue of removing the subsidy for now than allow the frustration of the masses to point out the direction for our distressed nation. On a final note, I wish to be educated whether subsidy is really such an economic monster as it has been projected by agents of the West. If it is, why is the USA paying about $20 billion a year to its farmers to subsidize agriculture? And if it is not, why this hullabaloo about our spending our own money to make life easier for our own people? Aja N. Aja is an Abuja-based legal practitioner, human rights activist and public affairs analyst. I chose to publish this article on my blog because I share his views on the subject. I’m not against the removal of subsidy buh my worry is the manner it was removed, without notice to Nigerians, at a period people had spent their salaries and no working refineries. Must it be on 1st Jan 2012? 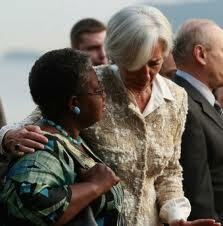 I suspect madam christine and her magic wand Ngo. Again, is the cabal making refineries not to work? Also, they’ve not been able to manage our funds adequately, how would they manage the 1.5 trillion? The SURE programme is only a restatement of every government’s duty to its people and the Governors quickly agreed as the amount they’ll receive has already been spelt out. as much as i disagreed with your arguement i just want to remind you that the 20billion dollars spent by the united states was on production and not on consumption. And that was why sanusi argued that if government must susidized it must be on production process within the country and not on items imported to consumed else you’re rendering the economy redordant thereby boosting the economy of the exporting nation. And that’s what they intend to change with the money that will accrue from the subsidy removal.